This post is sponsored by Califia. You’ve probably enjoyed their almond-based non-dairy milks, creamers, and coffee drinks, but have you had their new drinkable yogurt? 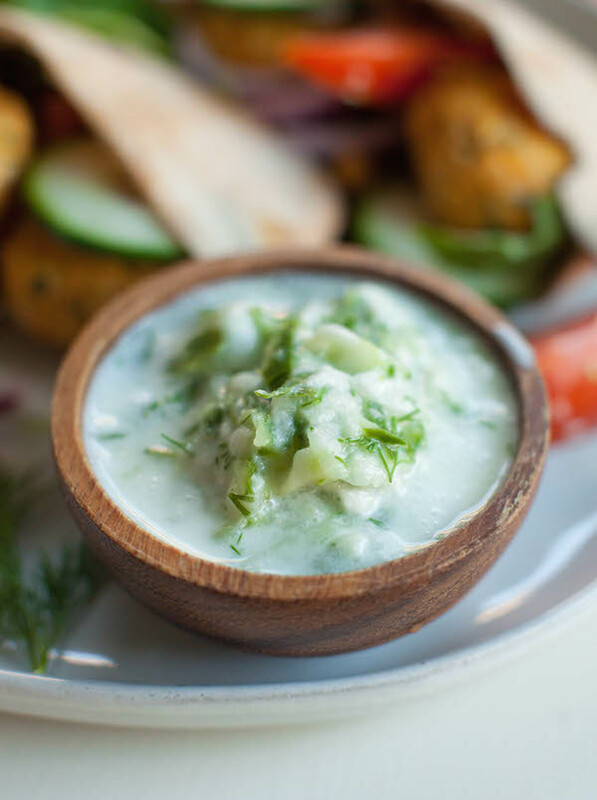 It’s delicious, and I was immediately inspired to use it for this cooling and versatile vegan tzatziki sauce. Don’t miss the video below to see how easy it is to make, along with a couple more must-make vegan sauces! The very last animal product I gave up before becoming vegan was yogurt. For most of my life, until that point, I couldn’t stand the smell and tang of yogurt. My mom would eat it in the car on our way to school and work, and I’d have to plug my nose. But when I finally stopped being a picky kid, I realized that I really like yogurt. Actually, I grew to love it! And before I became vegan I didn’t think I could give it up. For one, the commercials saying that it’s great for gut health had me convinced. Secondly, it’s such an easy snack! Of course I finally gave up yogurt because the reality of animal suffering far outweighed my desire for a creamy snack. And so it was, in 2011 I thought I’d said goodbye to yogurt for good. Giving up all dairy (yes even yogurt) to finally become vegan has actually been the best decision I’ve ever made. Immediately my gut health improved. For years I was eating yogurt to help improve my digestion, but it was doing quite the opposite––keeping me bloated, constipated, and constantly uncomfortable. The reality is, most of us cannot properly digest dairy products. For some of us an intolerance to dairy looks like an overabundance of mucus, while for others the damage presents itself in more surprising ways like acne, reproductive issues, and food allergies. I’ve been dairy free and vegan now for nearly 8 years, and I still have not experienced the digestive upset that I lived with until the day I gave up my final dairy product, yogurt. Fast forward to 2018 there’s really no need to think you’re completely giving up yogurt or other traditional dairy products when you become vegan. Plant-based milk is becoming more popular than dairy milk, vegan creamer has finally become a reality, and dairy-free yogurt is here! I love the tangy sour taste of yogurt, so I was super excited when Califia told me about their new drinkable yogurt. I wanted to try it immediately! The most common way I’ve been using it is in smoothies. Simply replace your regular non-dairy milk in your favorite blends for an extra boost of gut-friendly bacteria and fiber. My current favorite blend is: Califia non-dairy yogurt, fresh pineapple, romaine lettuce, banana, and frozen berries. So creamy, tangy, and sweet!! 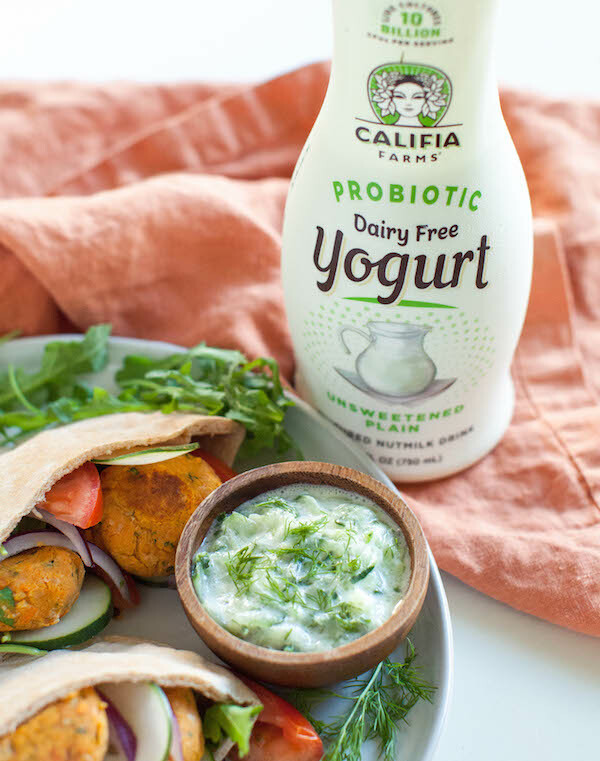 Califia’s plant-based yogurt is a terrific source of healthy gut bacteria, specifically Bifidobacterium, Streptococcus thermophilus, and Lactobacillus bulgaricus. The type of Bifidobacterium they use, called BB-12, is the most well documented and has shown to improve your immune system, tackle inflammation, and fight bad bacteria and yeast to keep your gut healthy. Read more about that here! 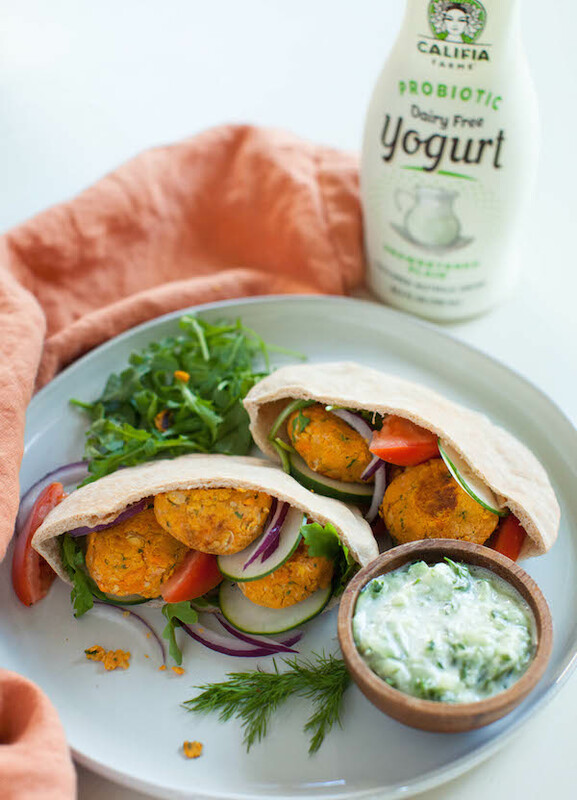 For this post I thought I’d share a savory and more exotic recipe with you: vegan tzatziki! Tzatziki is a traditional Greek cucumber yogurt sauce. 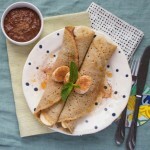 The ingredients are fresh and simple, and it can be used on a wide variety of foods. However, you may be most familiar with it in mezze platters or on a gyro. I’ve been using this vegan tzatziki nearly every day. I love the cooling combination of cucumber, yogurt, and dill (3 of my favorite ingredients). 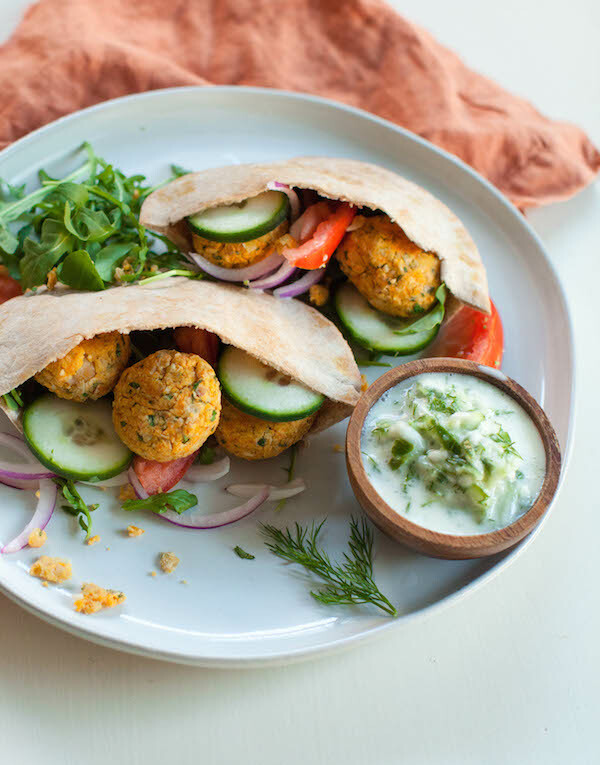 It’s delicious on salads, sandwiches, sweet potato falafel (pictured), grain dishes, or as a dip. And did I mention it’s super easy to make?! I always recommend that people keep a variety of their favorite vegan sauces in their fridge. Having a good sauce makes it easy to quickly add more flavor, texture, and pizzazz to a meal. 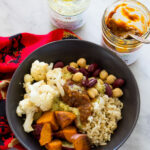 Got a boring bowl of steamed veggies, beans, and rice? Spice them up with a yummy sauce. You can even get yourself to eat more vegetables if you just top them with your favorite sauces. In the video below I show you how to easily whip up 3 perfect sauces––including this vegan tzatziki. Make them all at once and have fun topping your meals with them for the week! 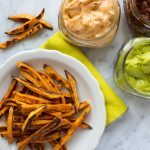 They’re all easy to make, full of flavor, and nutrient dense. Put the shredded cucumber between two paper towels (or inside of a nut bag), and squeeze the excess water out. Place the drier cucumber into a bowl, and add the remaining ingredients. Stir well, and season to taste with more salt if needed. Serve immediately, or allow it to marinate for about 1 hour before serving for even better flavor. This vegan tzatziki will stay fresh for 3-5 days, and the flavor becomes better each day.